It’s Aspen, baby. Survive this last Quickfire and Elimination Challenge and you’re in the finale. Perhaps in an effort to try and calm the inevitable nerves, or at least to forestall them, the three remaining cheftestants have a whimsical and lighthearted challenge. They’re to go fly fishing and catch a live trout, which they’ll use to make the best damn trout dish they can. For both tasks, they have 40 minutes. Total. Not a problem for the Joe’s, who catch their trout in quick succession, giving them over 30 minutes to make their dish. Poor, lonely Adrienne is left alone on the banks of the lake, begging a fish to take a nibble on her line. When one finally does, she has just over 20 minutes left. No problem, she thinks, I’ll make a semi-raw preparation. It’s a gorgeous trout that, just minutes ago, was swimming along happily in the water. What could be better? Cooking it, apparently. Guest Judge Chris Cosentino, past winner of Top Chef Masters, informs Adrienne that because bears . . . . umm, defecate upstream, the trout have to be cooked in order to eat them. Thus, of her pan-seared trout with spring onion and jalapeno ponzu vinagrette, the judges can only nibble around the edges, praising her crispy skin and garnishes, but not able to try the fish. Moustache Joe has a gorgeous looking smoked trout rillette with spring onion corn cakes and a summer berry glaze. Chris loves the throwback to pioneer eating, with the corncake and blueberry. Finaly, Joe Flamm has a pan-seared trout with black garlic beurre blanc with fennel, mushrooms, and bread crumbs. The dish is well conceived and well executed, though his skin doesn’t compare to Adrienne’s, which wins him the challenge. Which is not a small deal, given the stakes. Not only does he go into the Elimination Challenge with some momentum, he gets an advantage. The chefs will be cooking at the Aspen Food and Wine Classic (a BFD in the culinary world, in case you hadn’t already guessed) and will have to serve 200 folks, including amazing chefs and restauranteurs. In point of fact, the guest judge for the elimination challenge will be the legendary chef, Daniel Boulud. Given the demands of the challenge, each chef will have a little help in the form of one of the eliminated cheftetants. As the winner of the Quickfire, Joe Flamm picks Carrie—a smart choice given what a genius she is at combining flavors and her ever-sunny disposition. 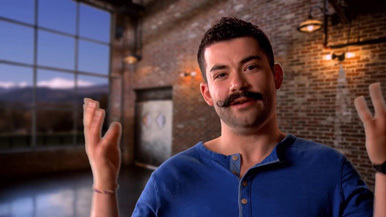 He also gets to assign the other two sous chefs—he sends Bruce to work with Adrienne and Chris to work with Moustache Joe, reasoning wisely that it’s best to avoid pairing the two chefs with Italian backgrounds (Moustache Joe and Bruce). The make matters even harder, the dishes served in the challenge must be vegetarian, and the chefs will be cooking outdoors with cowboy caldrons (huge metal pots filled with wood and charcoal, topped by a grill) that will serve as their only source of heat. Without a protein around which to build a dish, the three remaining chefs are left to scramble for a bit. How on earth do you reflect the rustic cooking environment and the semi-wood/charcoal stove, while at the same time making something high-end and innovative enough for the amazing group of folks who’ll be eating their food? This is a big career opportunity, and each of our chefs recognize that fact. As is typically the case on Top Chef, especially when the chefs are left to cook outdoors, there’s no shortage of problems. Luckily, the chefs seem to navigate them quite well. Moustache Joe doesn’t feel like his beets are taking on enough smokey, charred flavor, so he takes one of the logs from the fire and dumps it into his pot of stewed red beets. Then he wraps his yellow beats whole and buries them underneath the coals. Meanwhile, things are a disaster with Adrienne, who has bitten off way more than she can chew. She wanted to do tempura-fried shishito peppers but the batter is too thin, so she has to grill them. She wanted to make lime juice pearls but the agar is not working, and so she’s going to make a gelée. Her corn pudding is too soft, so she covers it up with coconut flakes. And off in his own little world, Joe Flamm is not having any major difficulties at all. He’s worried that his dish might be too simple, but no snafus so far.